Another requested follower from a generous patron. She’s from an anime I’ve never watched before called Rosario + Vampire. 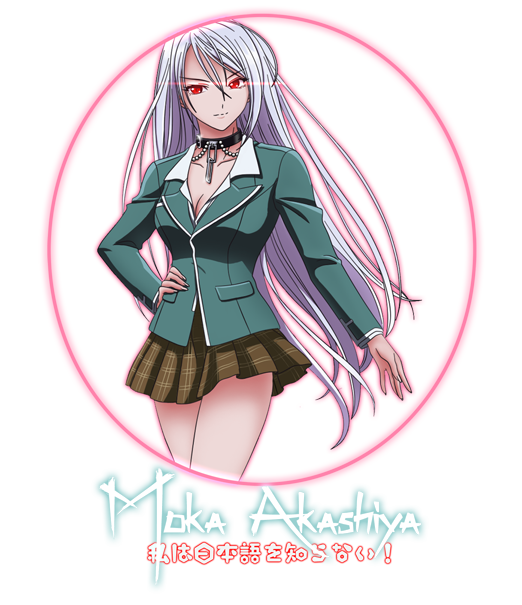 My understanding is that Moka is a nice vampire girl who has an alter ego called Inner Moka who has white hair. Nice Moka is passive, but Inner Moka is a kung fu vampire magic girl. I have no idea what the show is about, I’m just kind of winging it. The Requested wanted her to be in her outfit from the anime, so she’s not really lore friendly. You can pretend she’s from another world or something. Moka is a vampire from the foreign land. She seems to be stuck in her Inner form and has decided to travel around the world to find a way for her to merge with her other half and become whole again. Perhaps she’ll find an adventurer who will accept her as she is. Morthal in the Alchemy shop.